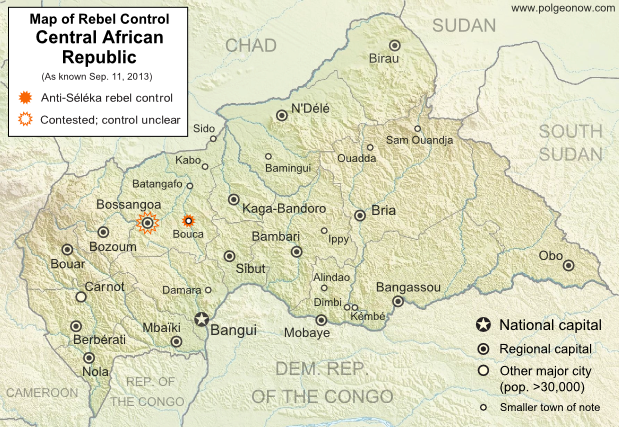 Two weeks ago, Political Geography Now reported on rebel control in the Central African Republic's new counter-rebellion. Since then, the towns of Bouca and Bossangoa have reportedly both been recaptured by forces belonging to Séléka, the former rebel coalition whose leader is now the president of the Central African Republic. However, as outrage grows over vicious violence against civilians which has continued since Séléka's campaign to take over the Central African Republic earlier this year, the new President Michel Djotodia has little actual control over the country. One another analyst says that "law and order stops outside the presidential palace" in Bangui, and the AFP reported earlier this month that "A large number of [Séléka] fighters answer only to their direct leaders, who have carved out personal fiefdoms in the wake of the rebellion". This raises serious questions regarding President Djotodia's claims that he is now dissolving and outlawing the Séléka organization. To see Séléka's rise to power illustrated in rebel-control maps, view all Central African Republic articles.